"We need to take the kids off of the streets," she said, "and they need to be in a place where they congregate and have fun. 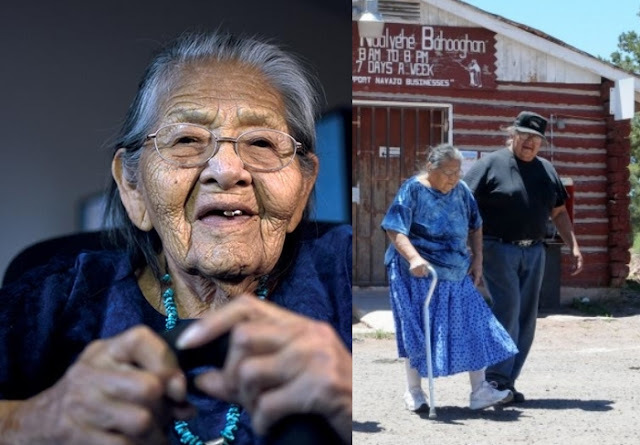 She had walked for years raising money for the youth of Chinle. Her 80-mile trek between Chinle and Window Rock was a common sight in September during the Navajo Nation Fair. 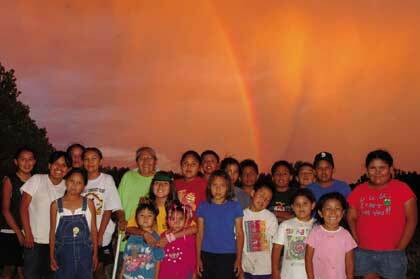 Children and their parents walked with her carrying buckets and signs asking for d onations to her cause, which was to build a youth complex in Chinle. Her goal at the time was to raise $25 million. In the end, she raised more than $100,000, which now sits unused in a bank account. The last time Thomas walked was in 2010. Her biggest supporter, her husband of 50 years, Leo Thomas, passed on in 2008. Her son Leon spoke on behalf of Marjorie (her first name), telling about her childhood and what she has been doing since she stopped walking. His mother recalled walking to the top of a hill where her teachers brought sandwiches, chips and sodas for her and her classmates. Afterward, they went to El Morro Theater to watch a Shirley Temple movie. Excited, Marjorie rushed down the aisle to find a seat only to be stopped by a Caucasian man, who told her that her place was on the balcony, where the non-whites sat, on wooden benches. Bothered by the experience, she could not enjoy the movie. When she got home, she asked her grandmother why they were treated badly. “‘Well, these people don’t understand the word love,’” she recalled. 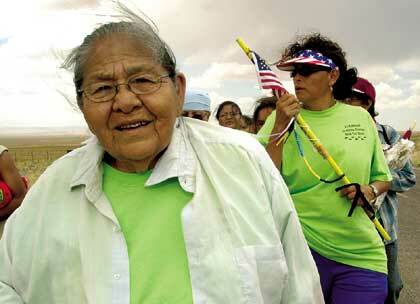 Responses to "Grandma Thomas Walked 80 Miles Each Year to Raise Funds for Youth Complex"